How did sandboarding get started? 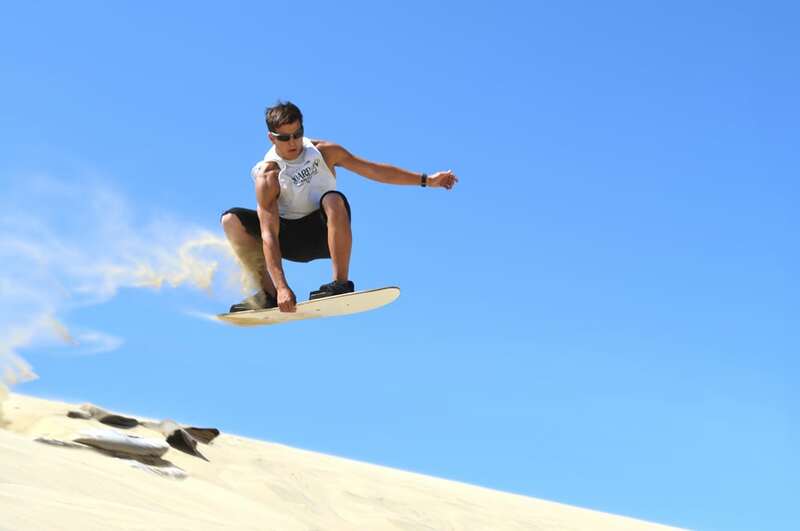 Like many, you may consider sandboarding to be one of the “latest” board sports. In a sense it is new and still fairly unknown. However, sandboarding is not as “late” as the word might imply. Sandboard pioneers and innovators have been busy developing the sport in there relative areas for the last half century. Thanks to the dedication of those with true passion for this sport, the internet and Sand Master Park in Florence, Oregon USA, sandboarding has come of age. Greatly influenced by the surf board, boards of every sort were soon to follow suit. The sandboard, like it’s cousin the snowboard, made sense to many and found a permanent place in their efforts to improve the sandy ride. In the early years pieces of cardboard, sheet metal, plastics, car hoods, snow discs, old surfboards and water skis lent themselves to the quest 20 years prior to actual sandboards being made. Through the 60’s sandboarding began to gain some notice with surfers and skateboarders who found that riding the dune was not only challenging but was also great fun. Shaping wooden boards specifically for the sand was a natural and primitive boards were then ridden like a skate or surf board, naturally.. no bindings and not sand specific shapes. By the mid 1970s sandboarding had been introduced in a handful of publications and television sports segments thanks largely to the efforts of sandboard pioneers, Jack Smith, (to those of you who know your skate history this is the same man) , along with the stylish riding of Gary Fluitt. Still, sandboarding was not to take its place at that time, no… snowboards quickly became the rage and abruptly pushed sandboards onto the back burner for another decade. Snow resorts were already operating with full facilities to cater to the masses. The ski industry and others were more than willing to offer a new twist to a proven past time and greatly boost revenues. And snow, like surf, was available at a good number of locations world wide. Snowboarding raced ahead. Sandboarding had to wait it out. Some preferred to ride the sand instead of concrete, snow or waves. One such person was Sandboard Magazine’s publisher and Sand Master Park director, Lon Beale. During the spring of 1972 Lon was introduced to a very primitive form of sandboarding through friends who migrated to the Mojave Desert, (home to many sand dunes). “A board that would glide over sand! I had to know everything I could find about it,” relates Lon with a smile, “The quest had begun.” Over the years ‘Doctor Dune’ emerged and Lon’s alter ego took promotion of sandboard to a whole new plateau. Progress after progress, innovation after innovation, the effort never stopped but only increased. By 1991 the good doctor had gone to production of not only sandboards but lubricants to improve the glide of sandboards as well all related gear. In their infancy sandboards were slow and inconsistent performers on various types of sand and terrain. Improvements were necessary if sandboarding was to hold its own. As development of snowboards evolved so too did sandboards. The similarities shared between the two sports allowed sandboarding to capitalize on snowboard technology. By keeping pace with the current technology sandboarding was able to bring the ride of a sandboard much closer to the level of other board sports without spending the dollars. While snowboards certainly influenced the sandboard’s design various details needed to be rethought because it’s NOT snow we ride. The base surfaces used on snow were excellent for snow but on sand proved to be disappointing. Improvements were vital to bring sandboard speeds up to par. One major improvement came in the form of a familiar surface material most commonly known by it’s brand name, “Formica”. Specially formulated waxes pushed acceleration to the next level. Currently there are sand specific materials used on sandboards that greatly out live previous base material and in fact, just keep getting faster with age! Now sandboards would streak to the bottom of even modest dunes at speeds that would terrify their passengers. We call it success. However, sand does not share the same properties as snow. Obviously temperature is one of them but sand reacts more like a liquid and by extension sandboarding is much closer to surfing. Surfers tend to pick it up with ease while snowboarders have to make a few minor adjustments. Today “Sandboard Magazine” on line is the gateway for any and all who have taken interest in international and/or local sandboarding. The vast majority were introduced the the sport through this portal. It was at this point in 1995 that the world, and the media, gained access to sandboarding. The surge of the INTERNET allowed the opportunity for sandboarders to come together for the first time from around the globe. There were several hundred sandboarders out there who were making thier boards and carving dunes completely unknown to each other believing they were the only ones doing this crazy sandboard thing! Recognizing the impact the internet had on sandboarding the media quickly pursued. Soon, sandboarding was popping up in major publications, television commercials, boards and accessories were advertised, web sites multiplied and events leaped to life. It seemed the world was now ready to surf the dunes. With a growing number of enthusiasts anxious to prove their skills agains those of another the the need for a foundation to build on was apparent. Dune Riders International ( DRI ) was formed in 1995 and continues to be the governing body for sandboarding world wide. DRI notes much of the increased participation is due to the easy crossover making sandboarding appealing to boarders of all types. The Sandboard World Tour sees annual events in several countries with skill catergories in Big Air, Slalom, Boarder Cross, Rail Slides, Drag Race and Free Style. Generally if you are boarding now you’ll have no problem adapting and sand is very forgiving. The appeal of the extreme continues to grab the attention of an action hungry world and this “latest” board sport, sandboarding, has found itself on an international center stage. Yes, by all indications it appears sandboarding has finally come of age. Some good advice for your first sandboard or sand sled.